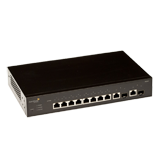 SR2208P is an 8 + 2 gigabit Ethernet port, cloud managed, fan less, desktop Layer 3 Lite (L2 and L3 static routing) switch. SR2208P is the best fit for situations when you need extra wired port capacity. SR2208P allows you to quickly extend your wiring closet and it is simply auto-provisioned, managed and monitored from Aerohive’s public or private cloud based HiveManager network management system. The switch provides the flexibility of either using 8 ports in 802.3af mode or 4 ports in 802.3at mode or any combination of the modes. 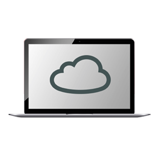 The Aerohive SR series switches utilize the power of the enterprise cloud to provide unified wired and wireless access with centralized management and visibility across the entire network. The SR switches provide energy-efficient gigabit Layer 3-Lite capabilities with flexible Power over Ethernet (PoE) options, as well as a wealth of port-density options. Critical capabilities, such as zero-touch provisioning, stacking, and powerful QoS make these switches a complement to any enterprise network. The SR2200 and SR2300 families are managed from the same enterprise public or private cloud HiveManager that is used to manage Aerohive access points, switches, and branch routers. This simplifies management of the wired and wireless network, allows acrossthe-network visibility, and reduces the time and complexity of initial switch deployments, expansions, upgrades and network refreshes. The need for trained installers or technicians is minimized and time-to-operation and expenses associated with managing large scale deployments is drastically reduced. The SR2208P fanless desktop switch offers quick and easy wiring closet extensions, while the SR2224P, an entry level access switch, offers simple wiring closet expansion. The SR2324P and SR2348P provide premium bandwidth and port density access on the edge of the network. SR families of switches can be brought online by simply shipping the equipment to the install site and plugging it in. Switches will automatically find the HiveManager, either in Aerohive’s public cloud or on a customer premises, download complete configuration, security, and corporate policies, and instantly provide service for connected devices.